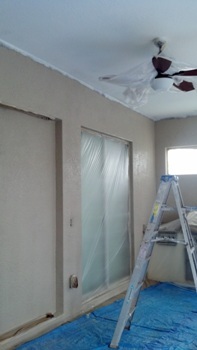 The home was cleaned and prepared for painting. All of the windows and hardware were taped. In the second picture you can see the exterior sprayed with Loxon Sealer. The texture on the home was very deep and required a 1.5 nap back roll. Our crew ate up the roller naps like they were going out of style with this texture. We sprayed the exterior non stop after prep for three days straight it seemed. Here is a video of our house painters spraying the exterior garage door of this home. This house exterior painting was completed in 5 days by our crew. 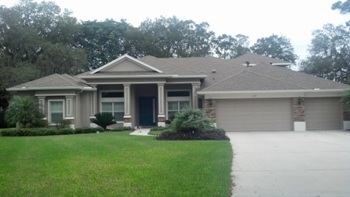 In this set of pictures you can see the rear portion of the exterior of this house painting Valrico project. 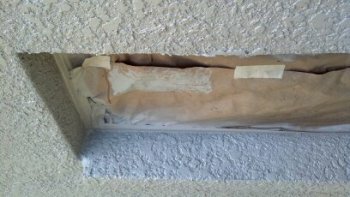 The area was covered in paper, plastic and tarps before painting. The ceiling was painted flat white. The back pool deck portion of this home received 2 gallons of sealer and 7 gallons of paint. Peerless House Painting LIC#PA2902 has been providing the Valrico, Bloomingdale areas with high detail painting services for ten years. 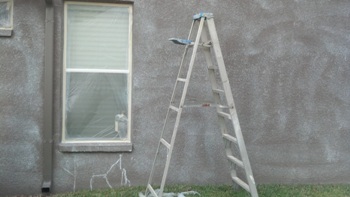 All of our house exterior painting projects come with a complete bleach cleaning prior to painting.